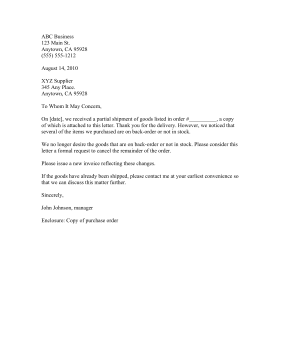 In the event of a partial shipment or otherwise incomplete order, use this letter to let the sender know your business needs to cancel its order for items that are not in stock. On [date], we received a partial shipment of goods listed in order #__________, a copy of which is attached to this letter. Thank you for the delivery. However, we noticed that several of the items we purchased are on back-order or not in stock. We no longer desire the goods that are on back-order or not in stock. Please consider this letter a formal request to cancel the remainder of the order. Please issue a new invoice reflecting these changes. If the goods have already been shipped, please contact me at your earliest convenience so that we can discuss this matter further.